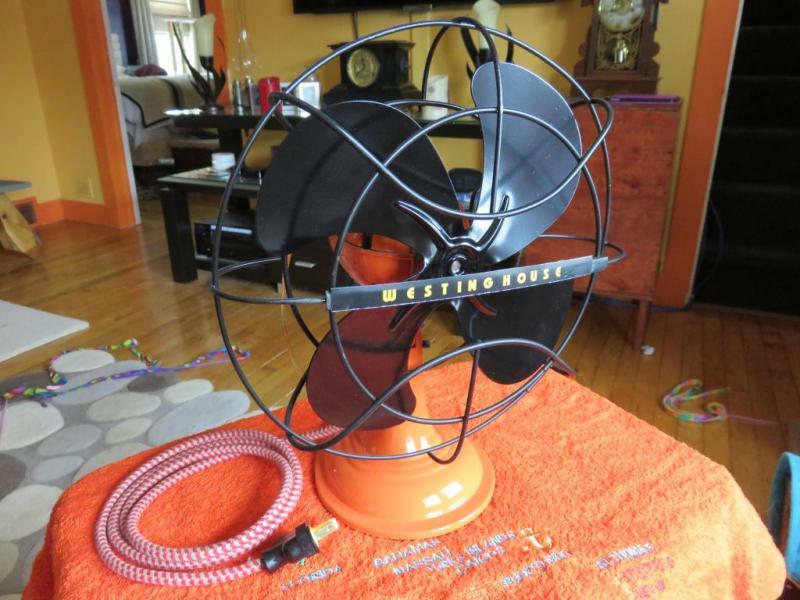 A Westinghouse 10LA Lively-Aire style # 1381425. I spotted one of these a few months ago on ebay painted in a very snazzy yellow and black paint scheme and fell in love with its 1950 Atomic age styling and the "hot-rod" paint scheme. I wanted to see if I could find a good restoration candidate and duplicate the sellers snazzy paint style. I managed to find one after a short search on ebay that looked in good enough shape to try it. The one I got had a badly scratched up and faded factory aqua blue paint job and the cage was mildly surface rusted. Disassembled motor housing from base, separated motor housing halves, removed armature and field coil, bronze bearings, and oscillator gears from built in gear box. Cleaned all internal parts, gears from oscillator gear box, inside of motor housing shells. Soldered new pigtail wires to field coil. Disassembled simple rotary switch, cleaned contacts, and reassembled. Cleaned all old paint from base and motor shell halves with soft brass wire brush wheels and Dremel tool. Cleaned dirt and corrosion from fan blade. Painted base and motor shell parts with orange base color. Painted raised ribs between motor cooling slots on motor shell top and bottom half with metallic silver enamel. This required hand painting with tiny artist brush to cover just the top surface of each rib with silver paint. Painted cage and fan blades gloss black. Created new Westinghouse badge on colored plastic for cage and glued in place. Reassembled motor parts, base, and new wire for base to motor connection. I replaced the rubber/elastic cording in the edge of the base with rubber screen-door windlace. I found an almost perfect diameter at the hardware store that would fit the channel in the base so that just the lower part of the windlace curve protrudes past the edge of the base. This provides a nice scratch free rubber ring around the base. 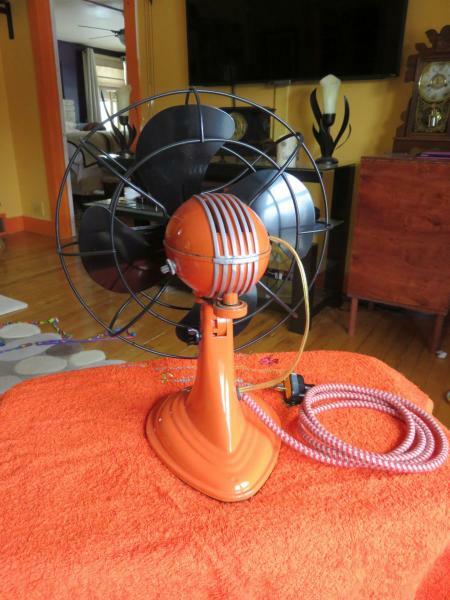 I used an 8 foot piece of new orange stripe cloth wire from Vintage Wire Co. to create the wall plug connection for fan. I know its not like original power cord but I was trying to stick with the "hot rod" color theme. Fan runs strong and smooth and oscillates well. 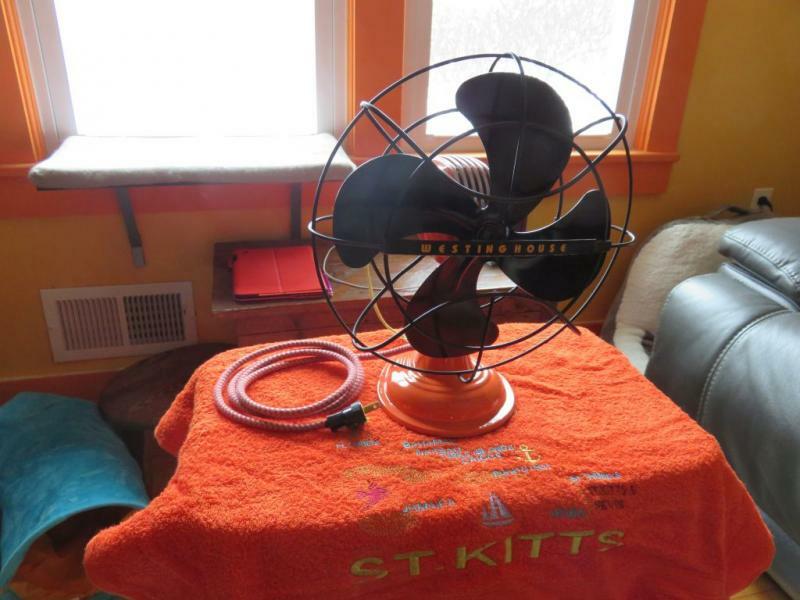 It has a fairly quick oscillation cycle but moves air in room well enough. 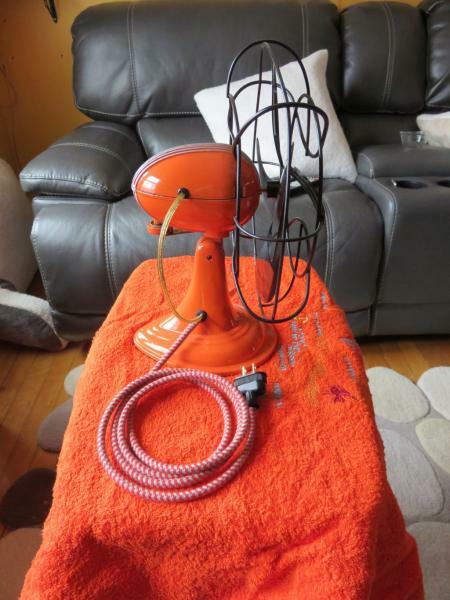 I would like to credit the seller on ebay who has listed a couple different versions of these eye-catchingly painted lively-aire fans for my inspiration. This was a fun little project and a good challenge in keeping a steady hand while painting. Nice job! The color is definitely lively enough to live up to the name! Thanks for sharing it. These are known for being difficult to refurbish, from a standpoint of the motor going back together and not being in a bind. Kudos for getting it up and running! I know what you mean about the armature being in a bind. I was able to use some sticky white lithium grease to hold the bearing retainer clips up inside the motor shell upper half to keep them from falling while I set the top half of the shell and lined up the long screws that hold the casing together. Looks very nice! 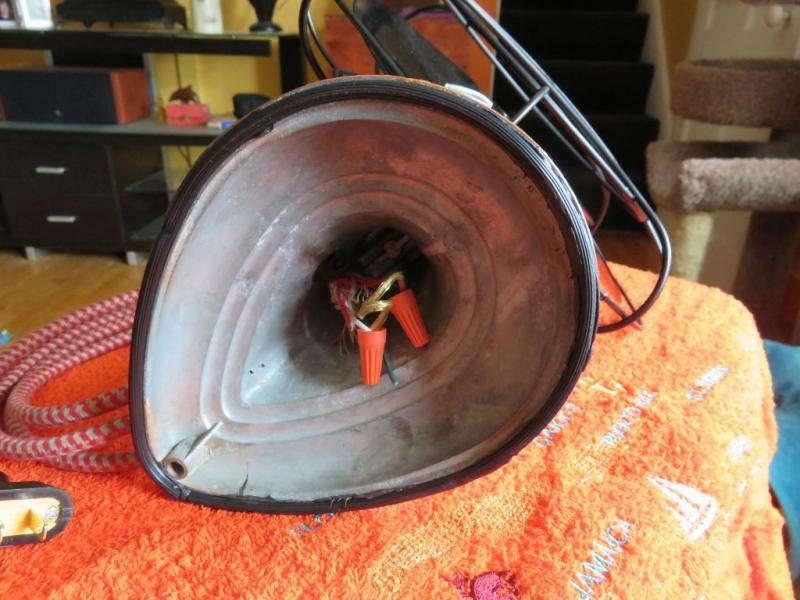 These dime store fans are fun to get creative with and you won't have to worry about hurting the value. Page processed in 0.1567 seconds (19% database + 81% PHP). 27 queries executed.